Thai people love to party. They love to enjoy their life, and they use every opportunity to celebrate. You can often see people parading through the streets, playing music and dancing and just having a great time. Note also that it’s a cool mix of generations – old people, middle aged and young ones, and oftentimes you can even see kids. If you walk around long enough during a Bangkok sightseeing tour, and you have a little bit of luck (or good planning), you can often see one of those parades. Another thing that’s great about them – they are open to everyone, and if you join in, they will be happy and glad to see a foreigner celebrating together with them. Below an article about one of the coolest celebrations in Thailand – the Thai new year, also known as Songkran. The article is written by Nattapol Bumsuntiea. The Songkran festival has been known to be one of the most important and grandest events of Thailand. It is a time of Buddhist rituals, of family gatherings to pay gratitude to elders and of course of water splashing. Deriving from the Sanskrit word, “Songkran” means to pass or to move into. In this case, the meaning implies the movement of the sun, the moon and other planets into one of the zodiacal orbits. And the Grand Songkran Festival which falls on the Aries indicates the novel era of the traditional Thai New Year. In order to welcome the New Year, the celebration will comprise the fun-filled local entertainments which combine the mutual relationship between members of the family, the society and the surrounding. Having the influence from India, the Songkran festival mirrors the traditional mode of life of the Thais which involves the cultural and agricultural aspects. Free from their regular routine task, the Thai citizens will find time to perform their yearly rites of showing respect to their elder relatives and departed ancestors. Moreover, there is a deep spiritual aspect to this grand festival nationwide. Even though Thailand has adhered to the international calendar since 1941, celebrations of the Songkran festival, presently set on April 13 and extending over the following two days, remain a more auspicious chance than January. Historically speaking, the Songkran festival has its origin during the Sukhothai period. It was practiced both in the royal court palace and among the ordinary citizens. However, the dimension of the celebration had not been as boisterous as of today. In the old days, civil servants and other government officials would pay homage to the king and would drink the oath of allegiance to the government, while the king would bestow annual salary to all officials. Later on in the Ayutthaya period, the festival had been expanded by including the bathing of the Buddha images. Also, the celebration would comprise the forming of sand pagodas and colorful activities. In the Rattanakosin period, the festival had been performed in the same way as those during the Ayutthaya period. The Songkran festival extends three important ritual days, from April 13-15. These days are called respectively: Wan Sangkan Long, Wan Nao and Wan Taleung Sok. It is customary that during the Songkran festival there is an announcement of the name of Nang Songkran of the year, her vehicle, her food preference and much more. To forecast the affluence of that year, it is worth knowing the amount of rainfalls and the number of Naga or legendary serpent which is responsible for the provision of water. The prediction for the New Year will be done in relation to that particular day of the Nang Songkran. This year, the Songkran’s Day falls on April 14. This means that Nang Songkran for 2007 is “Kimitatevee”, dressed in white with topaz ornament, preferred banana, dagger in the right hand, Indian vina in the left hand and buffalo as her vehicle. Songkran is a festival that serves a multitude of social and religious functions. It typically involves merit making, releasing birds and fish into rivers, presenting food and other offerings to monks, listening to sermons, building sand pagodas, paying respect to elders and splashing of water. Traditionally, houses have been meticulously cleaned the day before to ensure no bad luck is brought into the New Year. Later on the day in private ceremonies away from the temple, parents, grandparents, older relatives and teachers are honored by younger generations in a sacred ritual. Young people will pour fragrant water onto the palms of the older persons and also give them new clothes to show their respect and gratitude. It is believed that this watering ceremony would bring the young excellent health, longevity and prosperity. The Songkran festival is essentially related to water as Thai people believe that water splashing will bring abundant rainfalls in the incoming year. Water is also a symbol of fertility and is employed to clean up bad things. It is thus used widely in different ceremonies and rites of passage. Not surprisingly, one of the most vital parts of Songkran is the bathing of Buddha images. People will sprinkle water onto the images as a gesture of respect. A procession of Buddha images will be made prior to the bathing. After that people will also bathe the senior Buddhist monks by pouring water over them. The chief monk or abbot will then give a sermon and bless people who participate in these bathing rituals. And finally, people will enjoy splashing water at one another. Like many other festivals in Thailand, Songkran is celebrated with a zest and passion for having a great time that is uniquely Thai. In Bangkok, some famous venues for the Songkran festival include Khao Sarn Road, Bang Lamphoo District, Sanarm Luang and Phra Arthit Road in the Rattanakosin Island. Other sites of interest and events are Krung Kao Ayutthaya Songkran Festival (Old Capital of Songkran), well-known Thai-Mon Songkran Festival in Samut Prakan, Nong Khai, Chiang Mai and Phuket. In addition, the neighboring countries such as Myanmar, Cambodia and Laos have organized this type of festival with high-spirited celebrations. Highlights of the Songkran festival in these major cities include making merit to the monks, Buddha image procession, bathing Buddha images, setting free of birds and fish, erecting sand pagodas, blessing and being blessed by elders and senior government officers as well as enjoying water splashing. Additionally, tourists can watch traditional Thai performances as well as modern films and music, competition in the topic of the history of Songkran. There are also parades, carnivals, beauty contests (Miss Songkran and Miss Ladyboy Songkran) as well as the light and sound presentation relating to the legend of Songkran. 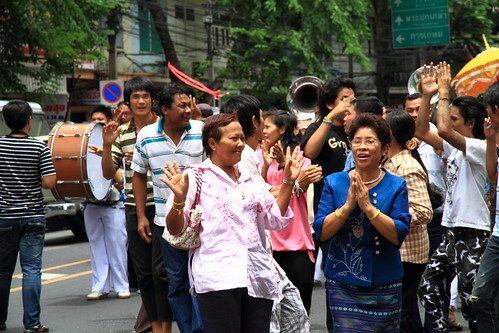 The consumption of much local food, Thai dessert cooking, local sports and art exhibitions complete the festival. Across the country, most young Thai people celebrate the New Year by gently throwing water over one and all with a word of blessing. Scoops from a silver bowl are traditional, but these days more effective soakings come from plastic buckets, pump-action water guns and even oil drums with stirrup pumps mounted on trucks. It is, however, all good-natured with the Thai’s communicable sense of fun. While the more traditional rites are best observed today in the villages and although Bangkok, Ayutthaya and Chiang Mai are known for the most exuberant celebrations, you will get wet and encounter Songkran wherever you are. It is the festival to give a lot of fun for all of us and welcome the traditional Thai New Year with a cool soaking of water in the most sweltering time of the year. http://www.iguidebangkok.com A gateway to Bangkok or the “City of Angels”, iguidebangkok.com is an attractive portal website accentuating the outstanding concept “where to go & what to do in Bangkok with clear guide map”. Complete with all-inclusive information on Bangkok accommodation, spa & massage, health & beauty, shopping & dining, map directories and tourist information guide as well as other interesting stories and monthly features for target surfers, iguidebangkok.com ensures you every click the smartest life in the metropolis. Each section of the website is meticulously designed as your intimate attendant for convenient metro-living.